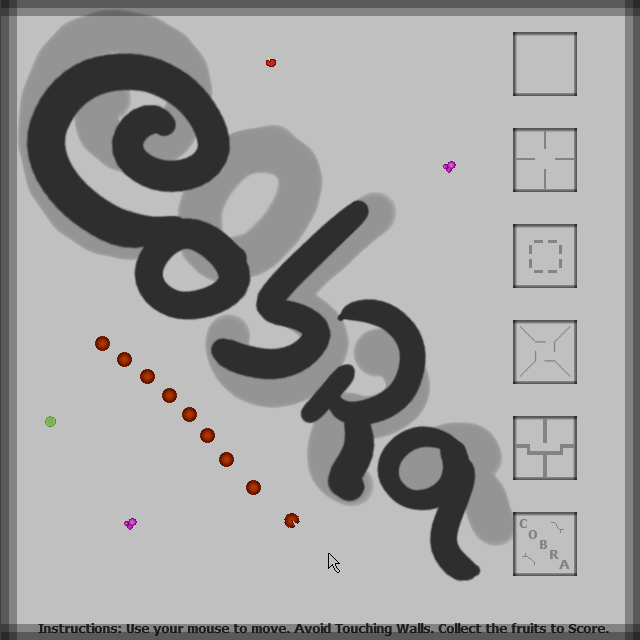 Cobra is a game that looks like snake, although, there are some important differences. First, you cannot control it's body, and it will not exactly follow the path you made. This makes the game a bit harder. Second, you control the head with your mouse. This makes the movement smoother and interesting. Third, the speed at which it moves varies with the distance to its target. So to be careful, you need to have your mouse close to the head. Collect the fruit to score, and avoid touching the walls. I hope you like it, have a good time. Programming time: Some more hours. Added Highscores and Time mode. Added two more levels. Graphic changes.